It can all get to be a confused blur of reservation stubs, receipts, important notes to follow up when we return home with dirty laundry and aching muscles from handling luggage that’s too heavy and much of which we really didn’t absolutely need. There is an answer, but it takes planning. The answer is go light! Our Mountain Tours adventures aim at experiencing the real local culture so we use public transportation whenever we can.Especially, the trains get us into close contact with people in the countries we visit. It does mean loading and unloading suitcases when we change trains or buses as we shift from high-speed rail to tiny narrow gauge cog-rail as we penetrate ever deeper into the backcountry. Places ordinary tourists rarely see. The lighter and more compact the luggage is, the more pleasant the whole experience can be. So let’s look at three rules they can help make travel a joy instead of a chore. Always use a case on wheels. Today there are many lightweight cases on wheels that can be purchased for under $100. They are a pleasure to use and worth every penny. You will check this bag on the airplane. Be sure that all your clothing is synthetic and wash and wear. It must be lightweight and drip dry wrinkle free overnight. 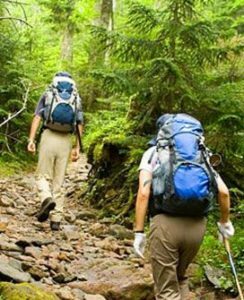 One carry on backpack should contain the basic essentials like tickets, passport, rain wear, maps, directions, telephone numbers, camera, toilet kit, and boots. You should be able to survive for several days with this carry on alone if your main luggage is lost or delayed in transit. This carry on is also your daypack when you go hiking. The weight of your case should be such that you could easily lift it on to a table top without undue strain. If it’s too heavy for you to do this, then you have too much. Remember that you will have to lift your bag on to trains. So keep it Light. Carry as much as you can bear so you will be ultimately comfortable when you stop. I subscribe to the second point. The kind of packing that one requires for, let’s say, the Haute Route, is just enough so you can get by each day. Your pack should come in at about 20 pounds. This is a basic list. There are special items, like knee or back supports for those who need them, and special medicines as required by individuals. There are gadgets like electronic positioning devices, cell phones, radios and other nonessential items, but nice to have.